Some members of the band visited the Summerbreeze festival in Germany this weekend. We met up with our friends from the Nuclear Blast merchandise stand on the festival grounds and got some rather unpleasant news on which we’d like to set the record straight. 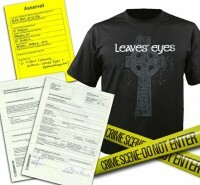 We heard the police showed up and confiscated Leaves’ Eyes shirts with a Celtic Cross on it. Apparently the police thought the design had something to do with right-wing symphathies. We also heard some fans were forced to take their shirt off with the same design and had to give it to the police as well. Later the police apologised for the mistake and brought back the shirts to the Nuclear Blast stand, after harrasing the merch people 5 times! We as a band want to state that we are shocked and disgusted by all what has taken place. Also, we are amazed by the ignorance of the police in these matters as clearly Leaves’ Eyes have nothing to do with such symphaties, nor does the design of the t-shirt. Clearly they need to do their homework a lot better!! We think it is a shame that things like this had to happen at one of the best metal festivals we know and also the merch guys and girls @Nuclear Blast, and last but least to our fans!!!!!! !